the whole development should be “zero-carbon”, including business sites, and the average home should be within a 10-minute walk of frequent public transport and neighbourhood services. successful bids will have to submit planning applications to local authorities, and confirmed previously announced requirements for 30% affordable housing. Is this welcomed toughening a moving of the goal posts during the bidding period, but one that shows the government is listening to and learning from the voices from environmentalists, bloggers and nimby anti eco-towners? Particularly welcomed is the whole development carbon zero approach – not just the homes. This entry was posted in comment, housing, News and tagged eco-towns on July 25, 2008 by martin brown. So, just how green will the eco-towns be? This entry was posted in housing, News and tagged eco-towns on July 13, 2008 by martin brown. There may be one or two things as important for humanity’s future, but nothing is more important than ecocities. But what is most often missed is the design and layout of our built environment of cities, towns and villages. Could we build cities that actually enrich soils, promote biodiversity and stabilize climate while creating a more beautiful human environment than ever seen before and one harmonious with the natural world as well? I’ve seen people move small steps in the right direction and stop, satisfied that they have arrived. They, for example, might recycle better and buy an energy saving automobile, but they still live a long way from work and their friends and drive anyway. I’ve seen them freeze up the city, opposing any new “density” in already existing neighborhoods or resist adding diversity of services and jobs to a neighborhood, clinging to the segregating single uses of zoning that helped the car scatter the city of car dependent and cheap energy dependent distances. This entry was posted in comment, links and tagged Eco Cities, eco-towns on June 27, 2008 by martin brown. an eco car for your eco home? Dont you just love this.? The eco car to go with your eco home, if your allowed one that is. Futurist, and Shaping Tomorrow colleague, CindyFW over in Kansas brought this to my attention through a recent twitter. I muse: what if in 10 years or so this is the common persons car, the one we all drive, powered by human, solar and hybrid fuels, then does it really make sense to conceive, plan and create new developments, eco towns and villages that restrict even prevent car access or ownership. Can we / do we want to restrict the use of such shiny eco friendly cars used on a community sharing basis? I guess the question is are eco towns attempting reduce / restricting cars on an environmental, pollution, carbon issue, or on a traffic congestion issue, or both, or on an approach that hasn’t been quite thought through using possible future scenarios as yet? 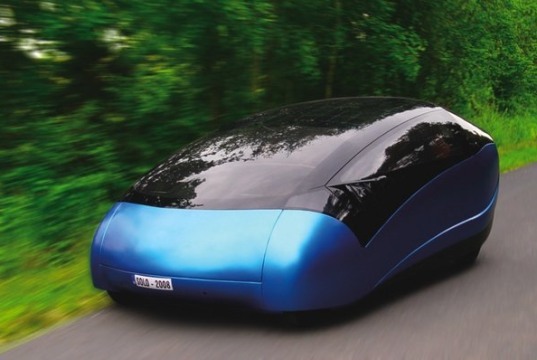 This entry was posted in comment, futures, housing, transport and tagged Eco Cities, eco-car, eco-towns, Twitter on June 25, 2008 by martin brown. Bristol is to become the first cycle city with 11 others – York, Stoke, Blackpool, Cambridge, Chester, Colchester, Leighton Buzzard, Southend, Shrewsbury, Southport and Woking – named as demonstration areas for the scheme. They will be added to the current six demonstration areas – Aylesbury, Brighton, Darlington, Derby, Exeter and Lancaster. On blogs, Mel’s excellent article over at Elemental on Global air conditioning while Phil at ZeroChampion has an interesting post on Should we carbonize interest rates? and Pam over at Public Works talks from the trenches on investing in infrastruture in the face of credit crunch. The Guardians articles that ‘revealed‘ the UK Governments blue print plans for a tougher approach to climate change. Many of which involved housing or buildings. Now why was this not included within the UK Government Strategy for Sustainable Construction. Joined up thinking, just in time thinking? The choice of sites put on a shortlist to be England’s first ecotowns has been strongly criticised for their lack of adequate public transport links and other shortcomings by a government advisory panel. This entry was posted in admin, blogs, comment, isite radar, links, News and tagged Agressive FM, air conditioning, be2camp, benchmarkwalks, Climate Change, coal, cycling, eco-towns, solar, Sustainable Construction Strategy on June 23, 2008 by martin brown. eco towns or eco slums? Lengthy and informative article by Charlotte Hunt-Grubbe on the Sunday Times website provides a good overview of the background, current status and future of the eco town initaive. Across the fair face of Albion, to the ringing of bells and the soft murmur of doves, appears a leafy flush of eco-towns. They are sun-dappled utopias, urban dreamworlds in which no human need is unfulfilled. Wildlife romps through bird-loud glades. People work at home or in business parks to which they can stroll or cycle. Public transport is swift, efficient and free, so cars are not needed. Community sports hubs, leisure and cultural facilities are so abundant that nobody wants to leave the town anyway. Children walk safely to schools in which the most popular subject is environmentalism. There are superstores for convenience, and farmers’ markets for friends of the planet. Allotments, too, for those who want to grow their own. Energy is renewable, insulation total and the carbon footprint zero. Sir Simon Milton, chair of the Local Government Association, spelt it out: “It’s no use building carbon-neutral, environmentally friendly houses if they are in the middle of nowhere with no facilities, so that people have to drive miles to buy a loaf of bread or take their kids to school.” If there were no local jobs or training, he said, the emphasis on social housing would serve only to create “eco-slums”. If only the UK’s new rash of eco-towns was as exciting as the high-profile eco-cities being planned abroad by British designers. “In Masdar,” says Lord Foster, “the pedestrian is king.” Masdar, the distinguished British architect’s scheme for a site near Abu Dhabi, will be a pioneering zero-carbon, zero-waste city. At first sight, its narrow streets, palm-tree-lined walkways, mosaic floors, low-rise buildings and sunlit open spaces are redolent of a modern Middle Eastern city. But there’s something profoundly otherworldly about Masdar. Sky rails meander overhead, solar-panelled awnings shade the streets, and there are no cars above ground. “We’re designing a new kind of transportation system,” explains Foster, “with driverless electric vehicles below street level that you can operate using your mobile phone.” When you dial them up, they take you straight to your destination. eco towns and zero carbon – chalk and cheese? worlds greenest city and eco home? eco … build, homes, villages and towns – pah… greenwash? This entry was posted in comment, housing, links and tagged eco-slums, eco-towns on June 16, 2008 by martin brown. The UK Government today launches its Sustainable Construction Strategy, with a whole raft of targets, measures and reporting mechanisms. It seems like it has been a long time coming, the consultation period being most of last year. Construction minister Shriti Vadera comments “Our aim is to become a world leader in sustainable construction” (Building). Time will tell. Looking back to the response from to consultation we submitted from the Collaboartive Working Champions, it seems the emphasis on integrated and collaboartive working, as a means to sustainability is recognised . To achieve improved whole life value through the promotion of best practice construction procurement and supply side integration, by encouraging the adoption of the Construction Commitments in both the public and private sectors and throughout the supply chain. A successful procurement policy requires ethical sourcing, enables best value to be achieved and encourages the early involvement of the supply chain. An integrated project team works together to achieve the best possible solution in terms of design, buildability, environmental performance and sustainable development. And note the reference to ethical sourcing, this is also picked up in the report as responsible sourcing, moving towards a cradel to cradle approach one would hope, maybe along the lines of BS6000, which will wake up a few people and organisations. And as fellow CWC and blogger Paul over at ExtranetEvolution comments it is good to see ICT within the Innovation section. I am not sure about the inclusion of the eco-town approach as a target though – has the strategy been hijacked, Trojan horse style, to embed political ambitions? however, and here is my main observation, admittedly after only a single read but…. I am disappointed to see a lack of facilities management in the document. The strategy is as much about the use, the consumption of buildings as it is about their design and provision. (something about focusing on the 1, out of the 1:5:200 concept). I am now aware that the facilities management sector in the UK is just too weak as a voice to get involved and influence the built environment sustainability agenda. Something that must change. Yes we may have here a viable construction strategy , but without the link to the end users and management of the facilities (note I avoid the word buildings) we may not have a strategy for a sustainable built environment. Oh, and why a sustainable document that has a solid black cover. The additional quantity of ink that will be used every time this document is printed or copied will be huge. The answer of course is not to print – but we are not all in the mindset of reading from the screen yet. This entry was posted in built environment, collaborative working, comment, construction, facilities management, innovation, IT, News, procurement, sustainability, waste and tagged 1:5:200, eco-towns, responsible sourcing, Sustainabile Construction Strategy on June 11, 2008 by martin brown. A case for reconstructing the world of sustainable building standards.